With competition in the telecom space heating up, the operators have been quick to roll out attractive tariff plans and woo subscribers. 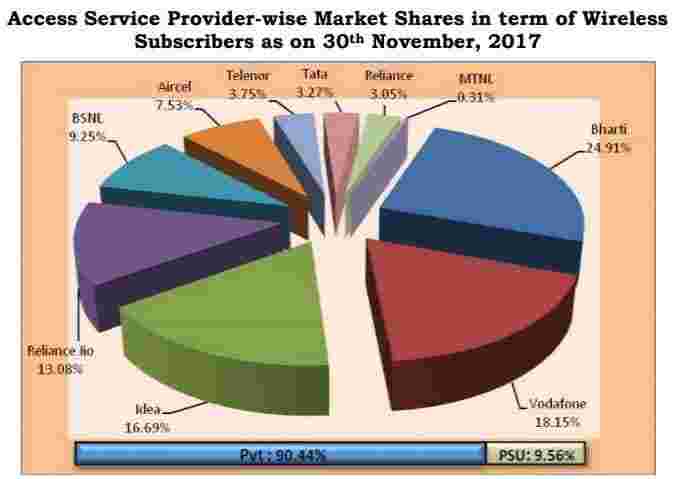 TRAI data reflects improvement in market share of incumbents during November 2017. 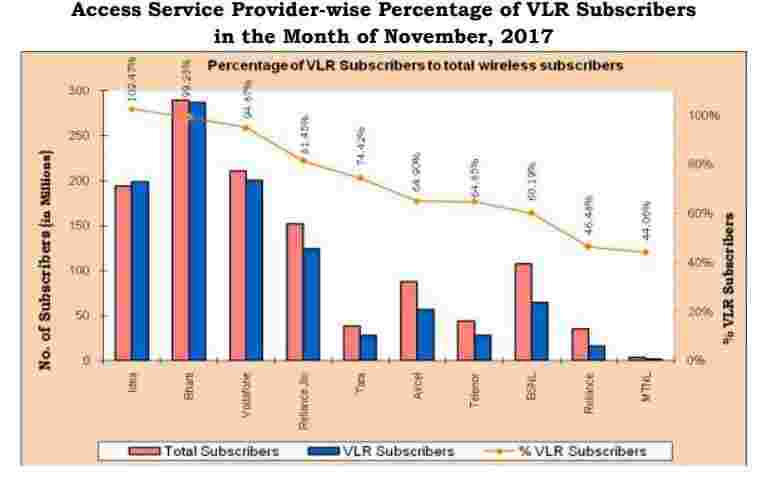 Telecom operators in the month of November amassed higher subscribers than the month before with Reliance Jio, Bharti Airtel and Idea leading the pack. Market share of Indian telecom major, Airtel stood at 24.91% in November as compared to 24.21% in October, 2017, TRAI data released on Thursday revealed. Second to rank in terms of market share during the month was Vodafone with 17.68% share. Idea and Reliance Jio ranked third and fourth with 16.69% and 13.08% share respectively. Airtel’s subscriber base nearly touched 30 crore in November, as per TRAI data. Total subscriber base of Airtel amounted to 28.95 crore. While that of Vodafone and Idea amounted to 21.1 crore and 19.40 crore respectively. 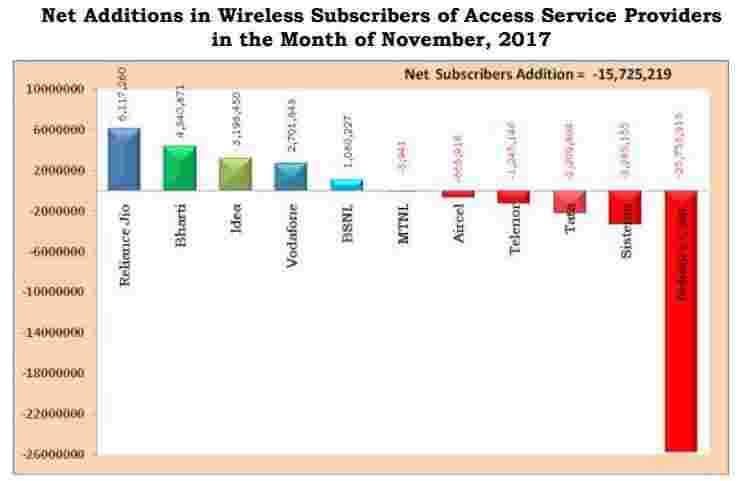 Coming to net additions among the wireless subscribers that totalled 116.24 crore in November as opposed to 117.82 crore in October. Once again topping the charts in this sphere, Reliance Jio’s net addition during the month was the highest as compared to other operators. The number of net additions to Jio’s network has been on the rise month on month. When the company was urging subscribers to go in for its Prime membership in April last year, net additions during the month remained low at over 38 lakh. Jio’s net addition to subscribers crossed 61 lakh in November 2017. Number of active subscribers on Jio’s network also improved during the month to 81.45% of its total subscriber base of 15.20 crore. 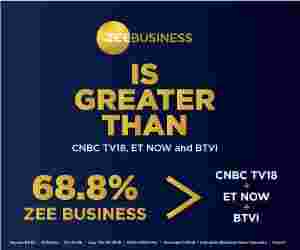 Earlier Zeebiz reported that Jio's active subscriber base amounted to nearly 70% of its total subscriber base till last year. Mobile number portability requests received during the month amounted to 1.59 crore. Reliance Communications that has agreed to sell its wireless assets to Jio lost out on subscriber base during the month. RCom’s market share reduced to 3.05% in November from over 5% in October.